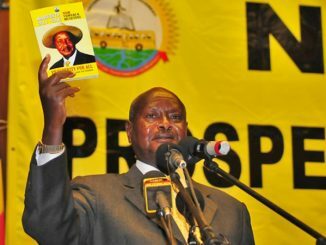 HomeOpinionsPress freedom in Uganda: Thumbs up for NRM or bold journalists? 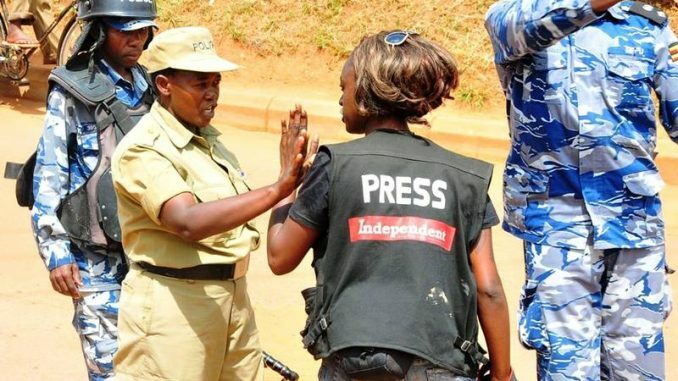 Press freedom in Uganda: Thumbs up for NRM or bold journalists? Despite the increased level of media freedom in Uganda over the last decade, journalists are still being targeted by national security laws. Courtesy Photo. President Museveni’s pledge of USh150 million to the Uganda Journalists Association (UJA) has been the centre of debate in the media fraternity. Some journalists think it was wrong while other say what matters is how the money is going to be used. Well, this debate gives us the opportunity to make a fresh assessment of the media freedoms in Uganda. The debate on media freedoms in Uganda is now premised on the challenge to reconcile the media’s original role as the vehicle of civic awareness and the realisation that partisan political interests tend to take the media as the third force in political contestations. But how did we reach here? Between 1986 and 2006 (non-partisan Movement Era), the media found duty in articulating and representing popular views and interests. In the absence of organised political groups, the media’s articulation of popular interests was viewed by the political elites as a function of politics. However, the political elite could only be tolerant to the media in so far as there was no organised political contest at the time. That is how what Charles Onyango-Obbo calls the Political Commentariat evolved as a force in the media and Uganda’s body political. People like Charles Onyango-Obbo, Andrew Mwenda, Onapito Ekomoloit, Peter Mwesige, Kyazze Simwogerere, Robert Kabushenga and many others made their marks by making passionate commentaries on popular interests. When competitive political contests resurfaced in 1996, the media had generated a lot of public interest in public affairs. The media therefore found itself in the unseemly position of being viewed as a partisan player. And any attempt to remind them (the media) that their role is that of a spectator (not active player) is always viewed by many as encroaching on media freedoms. That is the gist of the disagreement between political players and the media. So, is there press freedom in Uganda? The answer is yes and no. With the political players viewing the media as a third force, albeit without the encumbrances that come with being in the ring of political contestations, the state has sought to moderate the media’s attitude. This has been viewed by many observers as a roll back of the early gains of the Museveni regime. Without any conspicuous ideological differences, political groups are now merely involved in rhetoric oratory whose pay load is only of psychological value. This scenario has rendered the media as ‘the ring’ in which political contests are fought. Media reports of party members defecting to another party today and vice versa tomorrow are a testimony to of this scenario. Whether party members defect or not, the challenge is how the media reports it. So, given that the political players recognise the media’s capacity to influence political processes, is press freedom in Uganda an illusory myth or an ipso facto? For fear of being detained by hypothetical interrogation; I think we should start from the start. The relative press freedom in Uganda is the result of the experience and spirit of the armed rebel movement that mothered the political leadership in power to day. During the armed struggle, the rebel movement pursued what they called a policy of ‘open criticism and open debate’ as a tool to resolve disagreements. It is this openness the (then) rebels brought to government when they assumed state power in 1986. This formed the basis for a deliberate government attitude to run an open administration. Needless to say, this posture was the basis for the liberalisation of the electronic media and the resurgent influence of the print media on social and political behaviour. My very personal assessment is that there is enough press freedom to cause change of attitudes; political or otherwise. The problem however lies in the structure of the body politic. Other than centres of political leadership, there are no other centres of political influence in Uganda. And with the introduction partisan politics, any other leadership (or influence) centre is required to appreciate the supremacy of political leadership. This has led to the politicisation of all aspects of national life; even objective policy issues are now clouded in partisan political interests. The media is just trapped in this quagmire of Uganda’s body politic. With the liberalisation of the media, the control and dissemination of information is no longer the exclusive preserve of the state. This has rendered the state as merely ‘first among equals’ in the field. However, in spite of this status quo where the state is a mere player, information as a constituent tool for rallying the nation for policy absorption remains the responsibility of the state. The interests of the private media are clearly very different from those of the state. And the state’s attempt to bring her influence to bear on other players is sometimes the object of friction between the media and state. And of course the media cries foul and claim abuse of human rights and press freedom. Whereas the government’s deportment of toleration for free media feeds into universal charters on press freedom and human rights, we should recognise government’s deliberate policy on press freedom. Indeed there are states in the region that compare poorly with Uganda’s score on press freedom perception notwithstanding the adoption of those universal charters and constitutional provisions. Yet we must recognise the fact that the political elite are increasingly becoming jittery over an assertive media. Sometimes this jitteriness leads to a hurried hand in responding to the media’s actions or a deliberate inaction on media related policies. Perhaps the most significant aspect of the debate on whether there is press freedom in Uganda is the criminalisation of defamation. Some observers have argued that compared to the regional state of affairs, Uganda scores high on press freedoms. And whenever the government is accused of intolerance, the response is to refer to its earlier laurels for championing private media operations. This has bred a leisurely attitude to issues related to media policy. 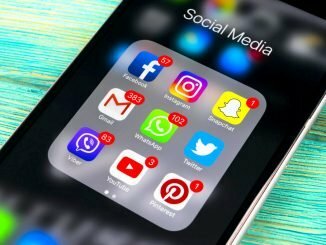 A friend who attended a conference on media freedoms in Ethiopia mid last year says he was taken aback when participants praised the Ugandan media as the best in the region. He was later to chide me for my ‘oppositionist and pessimist tendency of always viewing the government in a negative perspective’. But we shall get to that later. My friends challenged me: why do you think there was wide spread violence in all the countries that had national election between 2005 and 2008 except Uganda? 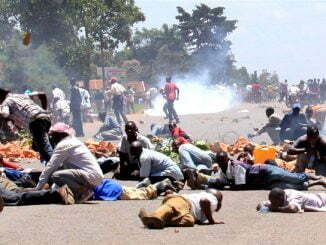 There was election violence in Ethiopia, Tanzania, Kenya and Zimbabwe but almost none in Uganda. My friend attributes this to the steadfastness of the Ugandan media. He argues that it is only in Uganda that even government owned media outlets like The New Vision (incidentally he is a senior guy at The New Vision) and Uganda Broadcasting Corporation can still moderate political tempers by carrying independent reportage. Given this argument, the question now is: Is Uganda’s media success story a cause for a thumbs-up for the NRM government or bold journalists? Either way one looks at it, he or she still faces the challenge to explain the proliferation of the media-related business since 1993. Truth is: the reality of government’s deliberate policy on liberalisation of the media industry is very conspicuous to be dismissed.